Playing is very beneficial for your dog. It will challenge him and keep him active. KONG Cuteseas are fun and cuddly toys made from corduroy. The squeaker and crinkly sound make the toy extra challenging for your dog. KONG Cuteseas are available in three different varieties and two sizes. KONG Cuteseas are soft and cuddly toys for your dog. Your dog can cuddle and play with it. The corduroy makes the Cuteseas extra soft. They also contain a squeaker, which makes them even more attractive for your dog to play with it. For even more fun the toy also has a crinkle sound. 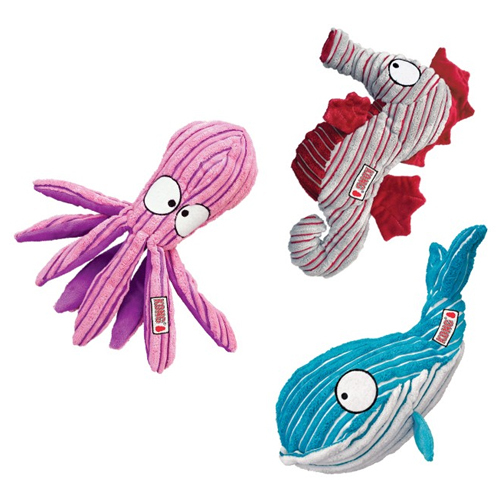 KONG Cuteseas are available in three varieties: whale, octopus and seahorse. The toys are available in two sizes: small and medium. Small: 16 x 7 cm. Large: 30 x 13 cm. Have you used KONG Cuteseas before? Let us know what you think about this product.